While I do believe that most dishes should be enjoyed in the company of friends and family, there are however, a number of dishes that are sometimes best eaten alone. Sometimes, it’s a secret indulgence that you’d rather not let anyone know about. After my workmate made fun of me eating a Mc Chicken for lunch (He said: “A foodie eating Mc Donalds?! I never thought I’d live to see the day! ), I vowed never to have fast food in front of anyone again. Other times, it’s aesthetics – a friend of mine once admitted that he would never eat oreo cookies in front of a crowd after an incident where he went around the whole day with chocolate crumbs stuck between his teeth without anyone telling him. 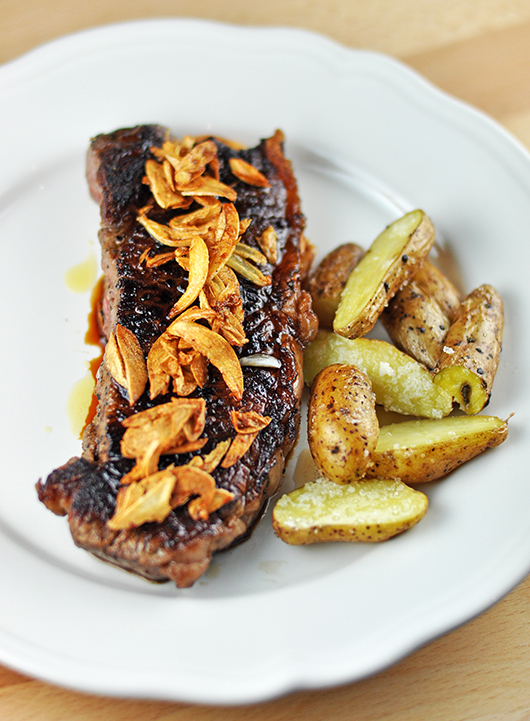 And on top of my list would probably be this gorgeous porterhouse steak with garlic chips. With all that crispy, pungent garlic on top of a well seasoned steak, I’d really rather not share this dish with anyone, plus I suspect after eating three garlic cloves to myself, people would be inclined to stay away. The recipe was adapted from a family recipe for salpicado, a spanish style tapas dish of beef strips on garlic. Allow the steak to rest for half of the cooking time. In the meantime, heat the rest of the olive oil and add the garlic. Fry off until golden brown. Pour the garlic chips and flavoured oil over the steak. Season with salt and pepper. Serve with baked potatoes or warm crusty bread. I really delighted to find this site on bing, just what I was looking for : D likewise saved to favorites . Do you know, that if you leave a garlic bulb to get old. I will produce a green shoot. We have all seen that , right. If you take a clove of garlic and remove the centre core where the green shoot would be. It doesnt make your breath smell. Try it. It works. Maximim flavour. Minimum smell. Looks like it was your husband’s loss. That looks like an amazing dinner! I would have no problem sitting down beside you and feasting on this meal. Bring on those pungent, tasty, crispy garlic chips! I really should learn from your example and make myself a fantastic meal whenever my husband is traveling – no more instant noodle bowls and cold sandwiches . . . This looks so amazing! I can’t wait to give it a try. You know what I love about foodies? Nothing is too complicated to make and eat alone! Love the sound of alluvium sativa’d chips! I love garlic in almost anything, steaks would be good. Trissa, I laughed when I read about your vowing never to have fast food in front of anyone again 😀 . I am now traveling in China and for the last 3 days, lunch was KFC and I felt that I had been cheated for my calories. Food to be eaten alone … that’s food for thought for me. But whatever it is, your steak with garlic chips look really good and while you may be eating it while your husband is away, I am sure he would insist that you cook it for him when he sees this! First of all, Trish, stunning pics. Secondly – if that is food you eat alone, you are truly my hero… I never take the time to cook for myself… well, I do and always, actually, but not that kind of lovely meal. I am a soup and salad gal. 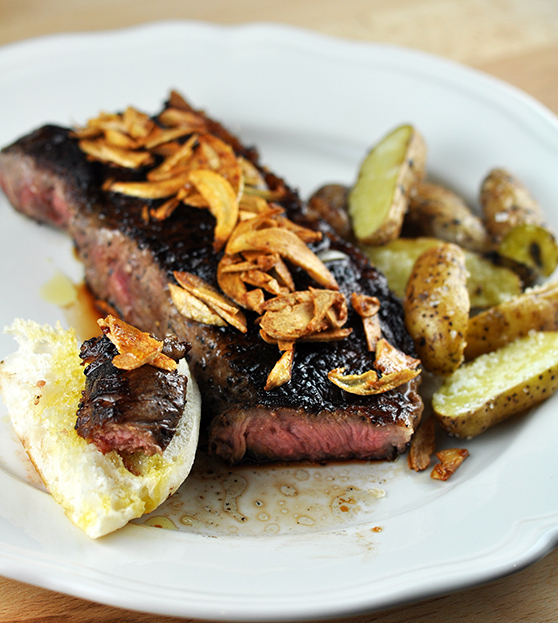 The garlic chips look gorgeous and the steak is done just the way I like it. What a tribute to yourself! Damn the bad breath! It would be a shame not to enjoy your delicious recipe for convenience … or, you have to be sure that your friend or beloved enjoyed the same dish! Love your post title, Trissa! Funny! I have to worry on two fronts. I live in an apt. and the garlic might not go over with my neighbors (who already make comments on how much cooking I do) and then, who would I get near the next day? I love garlic, but don’t like the aftertaste or dry feeling it leaves in my mouth. Luckily the husband likes garlic too! I love crispy garlic. I also steal some when my mum is making Palabok. ehehe. This is a great dish with a glass of wine on your own. A bit of indulgence with some along time. Oh Triss! There is nothing in the world like a good garlicky steak! What a wonderful fix for a carnivore … like me! Easy too! Oh! It’s almost dinner time here (actually, way past!) and I’m starving – and this post doesn’t help! I love steak and chips. Probably my favourite meal with bernaise sauce – mmmMMMmmm! Excellent comfort food and those fingerling potatoes sprinkled with salt have me gawking! Trissa, totally accept and agree with your philosophy of eating alone ! Garlic is good for health! So there’s no harm eating lots of garlic and it tastes pretty aromatic too. You may also use the fried garlic & scallion oil for mixing the cooked noodle. Simply delicious! Yummm…. Yours look really mouthwatering! Hope you’re having a great day. whoa, look at all that garlic chips! I would pick them off to eat right away just like I would when I eat roasted peanuts 🙂 But sadly you need to stay from people after eating them. But so worth it! You really know how to make dining alone an incredible experience! I’m glad that you emphasized good quality porterhouse – that makes a big difference! You can never have too much garlic. Just make your hubby eat some, too, and you’ll have no problems being embarrassed about garlic breath. Waw,..that’s quite a big plate of steak!! Only for you!! That’s certainly too much meat for me ,..but the steak & the side potatoes look so inviting!! Ooooh,..yes! Wow look at all that garlic on top! I am such a garlic fiend, I can’t help eating tons of it even though my breath is deadly after. Looks awesome Trissa. oh my! i want lunch and i want this. looks sensational! yes this one is for single enjoyment! My family enjoys adding garlic chips (and sometimes fried shallots) to chicken congee, the flavors are so much nuanced! What’s wrong with fast food?! I love it too =) This is gorgeous! Love the idea of serving with garlic chips! Food for one? Durian for me. Love the pink centre of your steak. It’s cooked perfectly. You are right ofcourse about certain foods best eaten alone. For me that is a really good club sandwich. I have to eat all the layers at once to be able to enjoy it fully, but while in company; that gets incredibly messy! And I always feel everyone is watching me when that happens! When food is this good, I don’t care who sees me eating it (or smells my breath afterwards!). Yummm! I know exactly what you mean! Garlic for us is the opposite – it’s a share food so we don’t notice the other person’s garlic breath, but my eat alone food is anything that involves cartiliage or soft bones. I love it and the bf hates it and looks at me as though I’m a freak! Oh i know those food craving. I find myself eating like a 5 year old when no one is watching. If I wouldnt be shunned if I got caught eating some of the little debbie snacks I would eat 😀 Being a foodie allows you to love all food. Sounds like a fun and delicious night without hubby! Secret food indulgences are exactly that…a secret! Macca’s never killed anyone just yet! I love this idea of frying garlic until crispy and serving it over a slab of protein! The meat looks perfectly cooked too! oh yum i love garlic hehe definitely something to eat when the other half isnt around! This would be so delicious. I love garlic! I know what you mean, sometimes there are times when the eating by yourself is a true joy. Love the steak and oh! I can imagine how good those garlic chips would have been with the fingerling potatoes! YUMM! I would save this for a ‘dinner for one’ as well. Don’t think my hubby is that fond of garlic. I do like it!